Quick Definition: The factors of production are inputs used to create goods and services. 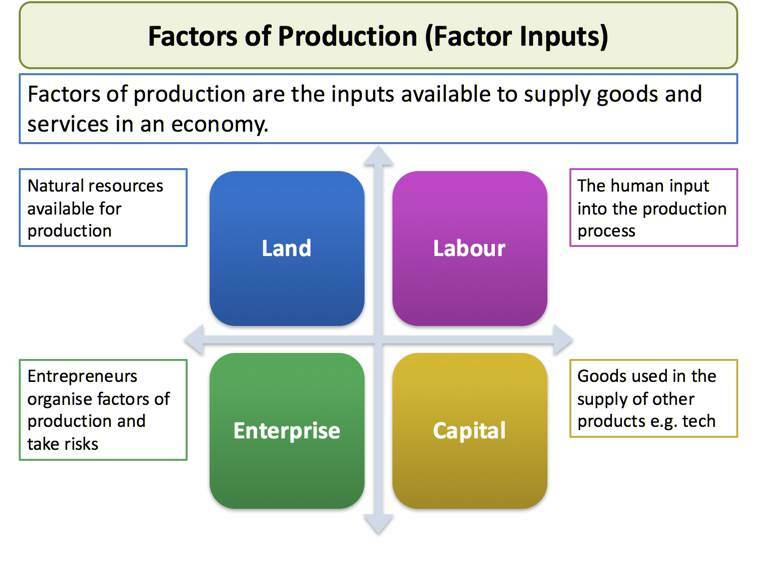 The four factors are land, labour, capital and human enterprise. The factors of production are the names for the inputs needed to produce a good or service. There are four factors of production: land, labour, capital and entrepreneurship (also known as human enterprise or innovation). 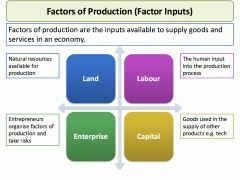 What makes up the factors of production? Land – Land is the term for the natural resources on earth that are used to produce a good or service. For example if a farmer rents or buys a field, he is using land as an input to produce crops. Labour – This is the human effort that is used in the production of a good or service. If the farmer employs people to work on his land, he is using labour as an input to produce crops. Capital – Capital is the term used to describe human-made goods like tools and machinery that are used to produce goods or services. If the farmer buys a combine harvester to produce more crops, he is using capital as an input to produce crops. Entrepreneurship – Entrepreneurship is when an individual takes an idea or innovation and tries to combine all the factors of production in order to make profit. If our farmer thinks of a new and potentially risky idea to increase the profits of the farm, he is using entrepreneurship as an input to produce crops.